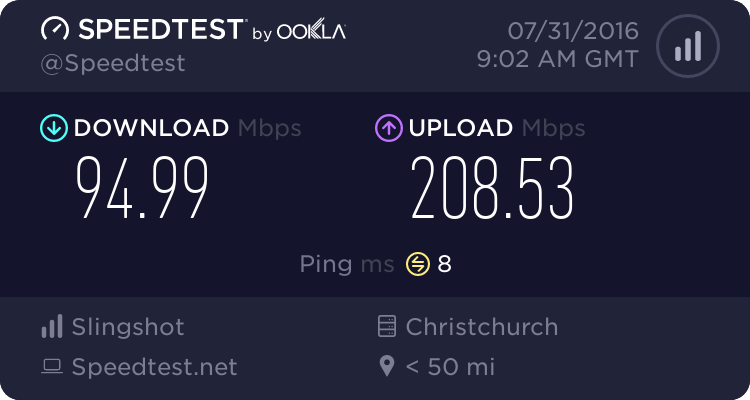 I too moved to Slingshots VDSL today and was disappointed that I couldn't forward ports 80 and 443 etc and was wondering if anyone had heard anything more about this update? For now I'm using the DMZ option which I'm ok with for now as I run TMG. Fairly certian Slingshot will be using TR-069 for management. No way would they use simple HTTP/HTTPS for management. You probably can't forward those ports because they are reserved for services on the router. Have a look in the 'Management' section and you will see all the services there like HTTP/S, Telnet, SSH, FTP etc. Change the HTTP and HTTPS ports to something non-standard and you then forwarding them to internal servers should be possible. After about 10 days modem started freezing 2-3 times/day so I turned off logging as some here have suggested - lockups seem to have disappeared but an interesting side affect was that WIFI performance immediately increased by about 6 - 7 Mb/s! Anyone know if this thing is capable of any bridge modes? I already have a competent router. Don't really have patience for some wannabe router that doesn't really work. lobster2: After about 10 days modem started freezing 2-3 times/day so I turned off logging as some here have suggested - lockups seem to have disappeared but an interesting side affect was that WIFI performance immediately increased by about 6 - 7 Mb/s! Wonder if I can reject the router under the CGA? I think we'd have pretty good grounds under the Consumers Guarantee Act as it states a product must be fit for the purpose in which it was sold / intended. I have been thinking of taking this road myself. Maybe all of us who have these router issues should keep calling slingshot and if they get enough pressure they might actually do something. I've been calling them pretty much weekly but keep getting the same old "The new firmware is in testing" speal and they wont release it until it's fully tested. I don't seem to be experiencing the "lock up" problems i just need the damn port forwarding to work! Countryman98: I think we'd have pretty good grounds under the Consumers Guarantee Act as it states a product must be fit for the purpose in which it was sold / intended. I have been thinking of taking this road myself. will let you know how I get on with the port forwarding. Sorry, but if you are running web and mail servers you really shouldnt expect your ISP supplied router to be up to spec to protect them. Get a Mikrotik and bridge a DV130 to it. chevrolux: Sorry, but if you are running web and mail servers you really shouldnt expect your ISP supplied router to be up to spec to protect them. Get a Mikrotik and bridge a DV130 to it. while thats true, they still need to fix the port forwarding, I want to run my minecraft server and RDP into my computer from tech! I do expect that when I have one device plugged in with a network cable the router does not fall over every hour! Is there a way to find out out what DLM profile you are on with this modem? dukester: Is there a way to find out out what DLM profile you are on with this modem? i would assume so, not 100% sure on that however since i dont have one handy. Can anyone help with my FTP set up? Until I got this modem everything was working fine, I've set up port forwarding and all but every time I try to test the FTP connection I keep getting "Server returned unroutable private IP address in PASV reply". I'm fairly well versed in this kind of stuff but I'm certainly not an advanced user, and everything I have tried has given the same result as above. I'd appreciate any help anyone could give me. You just need to use a non-standard port.